Fallujah[a] (Arabic: الفلوجة‎, al-Fallūjah Iraqi pronunciation: [el.fɐl.ˈluː.dʒɐ]) is a city in the Iraqi province of Al Anbar, located roughly 69 kilometers (43 mi) west of Baghdad on the Euphrates. 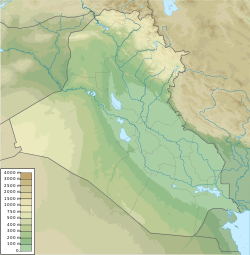 Fallujah dates from Babylonian times and was host to important Jewish academies for many centuries. In 2010, it was reported that an academic study had shown "a four-fold increase in all cancers and a 12-fold increase in childhood cancer" since 2004. In addition, the report said the types of cancer were "similar to that in the Hiroshima survivors who were exposed to ionising radiation from the bomb and uranium in the fallout", and an 18% fall in the male birth ratio (to 850 per 1000 female births, compared to the usual 1050) was similar to that seen after the Hiroshima bombing. The authors cautioned that while "the results seem to qualitatively support the existence of serious mutation-related health effects in Fallujah, owing to the structural problems associated with surveys of this kind, care should be exercised in interpreting the findings quantitatively". ^ a b "Iraq government loses control of Fallujah: PM Maliki vows "terrorists" will be eliminated after Islamic State of Iraq and Levant takes over town in Anbar province". Al Jazeera. 4 January 2014. Archived from the original on 17 November 2015. ^ Hassan, Falih; Arango, Tim (23 May 2016). "Iraqi Forces Try to Retake Falluja From ISIS". The New York Times. Archived from the original on 23 May 2016. Retrieved 24 May 2016. ^ a b "Iraq claims complete control over Fallujah, Islamic State resistance collapse". News.com.au. 26 June 2016. Archived from the original on 27 June 2016. Retrieved 27 June 2016. ^ Iraq: U.S. Should Investigate al-Falluja (Report). Human Rights Watch. 17 June 2003. Archived from the original on 24 December 2013. Retrieved 8 January 2014. ^ Michaels, Jim (4 January 2014). "Al-Qaeda militants in Iraq seize much of Fallujah: The fighting is the worst violence since U.S. forces left Iraq at the end of 2011". USA Today. Archived from the original on 19 June 2017. ^ "Iraq conflict: Sunni fighters 'control all of Fallujah'". BBC News. 4 January 2014. Archived from the original on 7 January 2014. Al-Qaeda-linked militants now control the south of the city, a security source told the BBC. An Iraqi reporter there says tribesmen allied with al-Qaeda hold the rest of Fallujah. ^ Memmont, Mike (4 January 2013). "'No One Controls Fallujah,' Which U.S. Soldiers Fought To Free". National Public Radio. Archived from the original on 4 January 2014. Retrieved 4 January 2013. ^ "Fallujah outside Iraq government control: security official". The Daily Star. 4 January 2014. Archived from the original on 3 July 2014. ^ "More than 100 die as Iraq battles Al-Qaeda". The Daily Star. 4 January 2014. Archived from the original on 25 October 2014. ^ "Iraq army shells Falluja to dislodge Qaeda, tribes". The Daily Star. 4 January 2014. Archived from the original on 4 January 2014. Retrieved 4 January 2014. ^ Dan Murphy (9 January 2013). "What's really going on in Iraq's Anbar Province?". Christian Science Monitor. Archived from the original on 10 January 2014. Retrieved 11 January 2013. ^ Theodore Karasik (14 January 2014). "Iraq's Anbar: is religion trumping tribe?". Al Arabiya. Archived from the original on 16 January 2014. Retrieved 6 March 2014. ^ "Iraq: Government Attacking Fallujah Hospital: Barrel Bombs Hit Residential Areas". Human Rights Watch. 27 May 2014. Archived from the original on 31 May 2014. Retrieved 11 June 2014. ^ "Iraqi, allied militias advance on Fallujah; new tactics squeeze ISIS". Rudaw English. Archived from the original on 29 June 2016. Retrieved 21 June 2016. ^ "'Human Catastrophe' Unfolds As Iraqi Army And ISIS Clash Outside Fallujah". Huffington Post. Archived from the original on 3 June 2016. Retrieved 21 June 2016. ^ "Battle for Fallujah: Iraqi troops die in ISIL attacks". Archived from the original on 1 December 2016.